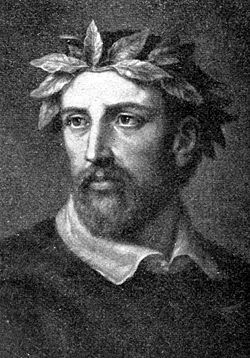 Torquato Tasso (March 11, 1544 – April 25, 1595) was an Italian poet of the sixteenth century. He is remembered primarily for two things: he was one of the first of the Italian Romantics, and he was able to merge Italian romances—melodramatic stories of passion and fantasy—with the classical, Latin forms of epic poetry. Of a romantic mindset long before the term "romanticism" had been formally coined, Tasso naturally attracted a great deal of attention from the Romantic poets and writers of the eighteenth- and nineteenth-centuries in northern Europe. Johann Wolfgang von Goethe wrote an epic entitled Torquato Tasso, perhaps altering Tasso's ultimate legacy. Through Goethe, Tasso became, and continues to be—particularly to non-Italian-speaking audiences—a symbol for the "tortured artist." His long, unfortunate, and painful life became a model to many authors of Romanticism for the ideal artist who suffers for his art. It is true that Tasso spent most of his adult life labeled a madman, locked up in prisons or asylums; but it is important to note that most of Tasso's greatest poetry came in the years of his greatest freedom and clarity. Tasso's reputation as a "mad artist" who wrote much of his greatest works under extreme duress is largely a matter of invention. Although Tasso's life went through much hardship, Tasso's poetry—not his life—is the basis on which he will be judged. Accordingly, Tasso's greatest contribution to literature is his Christian epic Gerusalemme liberata (Jerusalem Delivered), which combines the style of the Virgilian epic with a historical narrative of the Crusades, interspersed with lyrical, Romantic passages unique in Italian literature that are utterly Tasso's own innovation. Gerusalemme would win a wide audience throughout Europe, and imitations and translations of the poem would crop up with greater and greater frequency as the Romantics gained momentum in succeeding centuries. Tasso's reputation among Italians has always been one of genius; and it is clear that Tasso's influence on poets the world over has been instrumental, even if he has been often misunderstood. Tasso was the son of Bernardo Tasso, a nobleman of Bergamo, and his wife Porzia de Rossi. His father was for many years a secretary in the service of the Ferrante Sanseverino, prince of Salerno, and his mother was closely connected with the most illustrious families of Naples. Unfortunately for Tasso's father, the prince of Salerno proved to be a poor ally. He came into collision with the Spanish government of Naples, was outlawed, and then deprived of his wealth and territory. Tasso's father shared in this disaster, and the family's finances never fully recovered. Bernardo Tasso was proclaimed a rebel to the state, together with his son Torquato, and his patrimony was sequestered. In 1552 Tasso was living with his mother and his only sister Cornelia at Naples, pursuing his education under the Jesuits, who had recently opened a school there. The precocity of intellect and the religious fervor of the boy attracted general admiration. At the age of eight he was already known throughout the city. Soon after this date he joined his father, who then resided in great poverty in Rome. News reached them in 1556 that Porzia Tasso had died suddenly and mysteriously at Naples. Her husband was firmly convinced that she had been poisoned by her brother with the object of getting control over her property. When an opening at the court of Urbino was offered in 1557, Bernardo Tasso gladly accepted it. The young Tasso became the companion in sports and studies of Francesco Maria della Rovere, heir to the duke of Urbino. When he came of age, Tasso was sent to study law at Padua. Instead of applying himself to law, the young man bestowed all his attention upon philosophy and poetry. He began to write fragments of an historical epic on the re-conquest of Jerusalem—which would ultimately became his masterpiece Gerusalemme Liberata—but the young Tasso realized he was too inexperienced to attempt the poem at that time, focusing instead on a narrative poem on chivalry entitled Rinaldo. Before the end of 1562, he had finished Rinaldo, and the poem exhibited attributes that were to become integral to Tasso's mature style: the regularity of Virgilian form, combined with the attractions of Romantic lyricism. Tasso's father was quite taken with the poem, agreeing to print it, as well as letting his son continue to write under the patronage of Cardinal Luigi d'Este. 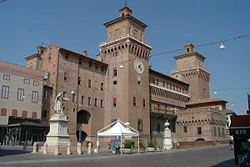 In 1565, Tasso for the first time set foot in that castle at Ferrara. After the publication of Rinaldo he had expressed his views upon the epic in some Discourses on the Art of Poetry, a prominent work of literary criticism which committed him to a distinct theory—namely, a "modified classicism" that adheres to most of the ancient Aristotelian laws of poetry—gaining for him the additional celebrity of a philosophical critic. The five years between 1565 and 1570 seem to have been the happiest of Tasso's life, although his father's death in 1569 caused his affectionate nature profound pain. Tasso was young, handsome, and accomplished in all the exercises of a well-bred gentleman. He was a rising star in the literary world. He was the idol of the most brilliant court in Italy. The princesses Lucrezia d'Este and Leonora d'Este, both unmarried, both his seniors by about ten years, took him under their protection. Frankness of speech and a certain habitual want of tact caused a disagreement with his worldly patron. He left France the following year, and took service under Duke Alfonso II of Ferrara. The most important events in Tasso's biography during the following four years are the publication of the Aminta in 1573 and the completion of the Gerusalemme Liberata in 1574. The Aminta is a pastoral drama of very simple plot, but of exquisite lyrical charm. It appeared at the critical moment when modern music, under Palestrinas impulse, was becoming the main art of Italy. The honeyed melodies and sensuous melancholy of Aminta exactly suited and interpreted the spirit of its age. We may regard it as the most decisively important of Tasso's compositions, for its influence, on opera and cantata, was felt through two successive centuries. The Gerusalemme Liberata occupies a larger space in the history of European literature, and is a more considerable work. It was finished in Tasso's thirty-first year; and when the manuscripts lay before him the best part of his life was over, his best work had been already accomplished. Troubles immediately began to gather around him. Instead of having the courage to obey his own instinct, and to publish the Gerusalemme as he had conceived it, he had the poem sent in manuscript to several literary men of eminence. Tasso expressed his willingness to hear their criticism and to adopt their suggestions unless he could convert them to his own views. The result was that each of his friends, while expressing in general high admiration for the epic, took some exception to its plot, its title, its moral tone, its episodes or its diction, or some other detail. One wished it to be more regularly classical; another wanted more romance. One hinted that the inquisition would not tolerate its supernatural machinery; another demanded the excision of its most charming passages. Tasso had to defend himself against all these criticisms, and, though he attempted to revise the poem, his revisions were by and large damaging to the poem; scholars agree that Tasso's experiment in proofing the poem was one of his worst disasters. As in Rinaldo, so also in the Gerusalemme Liberata, Tasso aimed at ennobling the Italian epic style by preserving strict unity of plot and heightening poetic diction. He chose Virgil for his model, took the first crusade for a subject, and infused the fervor of religion into his conception of the hero, Godfrey. But his own natural bias was for romance. In spite of the poet's ingenuity and industry, the main plot evinced less genius than the romantic episodes with which he adorned it. Godfrey, a mixture of pious Aeneas and Catholicism, is not the real hero of the Gerusalemme. The fiery and passionate side-characters, Rinaldo, Ruggiero, the melancholy, impulsive Tancredi, and the chivalrous Saracens, with whom they clash in love and war, prove to be the real heart of the poem's action. The action of the epic turns on Armida, the beautiful witch, sent forth by the infernal senate to sow discord in the Christian camp. She is converted to the true faith by her adoration for a crusading knight, and quits the scene with a phrase of the Virgin Mary on her lips. There is brave Clorinda, who dons armor, fighting in a duel with her devoted lover who no longer recognizes her. These lovely minor characters, so touching in their sorrows, so romantic in their adventures, are the true heroes of Tasso's epic, and the fact that his writing is nowhere greater than when it is describing their stories is testament to this fact. Tasso's great invention as an artist was the poetry of sentiment. Sentiment, not sentimentality, gives value to what is immortal in the Gerusalemme. Romantic love was a new thing in the sixteenth century, and poetry of what we would call the emotions was still very new in Tasso's time. His poetic sentiment, refined, noble, natural, steeped in melancholy, exquisitely graceful, pathetically touching, breathes throughout the episodes of the Gerusalemme and gives it its power. Tasso's self-chosen critics were not men to admit what the public has since accepted as incontrovertible. They vaguely felt that a great and beautiful romantic poem was embedded in a dull and not-very-correct epic. In their uneasiness they suggested every course but the right one, which was to publish the Gerusalemme without further dispute. Tasso, already overworked by his precocious studies, by exciting court-life and exhausting literary industry, now grew almost mad with worry. His health began to fail him. He complained of headache, suffered from fevers, and wished to leave Ferrara. The duke refused to let him go, (correctly) fearing that Tasso meant to take his greatest epic and publish it elsewhere. After years of being kept a virtual prisoner in the duke's court, Tasso's mental health began to deteriorate; after a number of scenes, he was imprisoned in a convent by order of the duke. He escaped, and fled to Sorrento. After the beginning of 1575, Tasso became the victim of a mental malady, which, without amounting to actual insanity, rendered him a misery to himself and a cause of anxiety to his patrons. While at Sorrento, Tasso yearned to return for Ferrara. The court-made man could not breathe freely outside its charmed circle. He wrote humbly requesting to be taken back. The duke consented, provided Tasso would agree to undergo a medical course of treatment for his melancholy. When he returned, which he did with alacrity under those conditions, he was well received by the ducal family. All might have gone well if his old maladies had not revived. However, what followed were scenes of irritability, moodiness, suspicion, wounded vanity and violent outbursts. In the summer of 1578 he ran away again, traveling through Mantua, Padua, Venice, Urbino, and Lombardy. In September be reached the gates of Turin on foot, and was courteously entertained by the duke of Savoy. Wherever he went, wandering like the world's rejected guest, he was met with honor due to his illustrious name. Great folk opened their houses to him gladly, partly in compassion, partly in admiration of his genius. But he soon wearied of their society, and wore their kindness thin by his querulous disposition. It seemed, moreover, that life was intolerable to him outside Ferrara. Accordingly, he once more opened negotiations with the duke; and in February 1579 he again set foot in the castle. Tasso, however, had chosen a bleak time to return to the duke's kingdom; the duke was aging, his hold over his land eroding, and the greeting Tasso received on his arrival was grim. Tasso was insulted, and without exercising common patience, or giving his old friends the benefit of the doubt, he broke into terms of open abuse, behaved like a lunatic, and was sent off without ceremony to the madhouse of St. Anna. This happened in March 1579; and there he remained until July 1586. It was no doubt exasperating for a man of Tasso's pleasure-loving, restless and self-conscious spirit to be kept for more than seven years in confinement. The letters written from St. Anna to the princes and cities of Italy, to warm well-wishers, and to men of the highest reputation in the world of art and learning, form our most valuable source of information, not only on Tasso's condition, but also on his temperament. It is intriguing that he spoke always respectfully, even affectionately, of the Duke. What emerges clearly from them is that he labored under a serious mental disease, and that he was conscious of it. He occupied his uneasy leisure with copious compositions. The majority of his prose dialogs on philosophical and ethical themes, which is very considerable, we owe to the years of imprisonment in St. Anna. Except for occasional odes or sonnets—some written at request and only rhetorically interesting, a few inspired by his keen sense of suffering and therefore poignant—he neglected poetry. But everything which fell from his pen during this period was carefully preserved by the Italians, who, while they regarded him as a lunatic, somewhat illogically scrambled to preserve everything he wrote. Nor can it be said that society was wrong. Tasso had proved himself an impracticable man; but he remained a man of genius, the most interesting personality in Italy. In the year 1580, Tasso heard that part of the Gerusalemme was being published without his permission and without his corrections. The next year the whole poem was given to the world, and in the following six months seven editions issued from the press. The prisoner of St. Anna had no control over his editors; and from the masterpiece which placed him on the level of Petrarch and Ariosto he never derived one penny of profit. A rival poet at the court of Ferrara undertook to revise and edit his lyrics in 1582. Certainly the history of Tasso's incarceration at St. Anna is one to give pause. Like Hamlet, he was distraught by ill-accommodation to his circumstances and his age. In the prison he bore himself pathetically, irritably, but never ignobly. He showed a singular indifference to the fate of his great poem, a rare magnanimity in dealing with its detractors. His own personal distress, that terrible malaise of imperfect insanity, absorbed him. In 1586 Tasso left St. Anna at the solicitation of Vincenzo Gonzaga, prince of Mantua. He followed his young deliverer to the city by the Mincio, basked awhile in liberty and courtly pleasures, enjoyed a splendid reception from his paternal town of Bergamo, and produced a meritorious tragedy called Torrismondo. But only a few months had passed before he grew discontented. Gonzaga, succeeding to his father's dukedom of Mantua, had scanty leisure to bestow upon the poet. Tasso felt neglected. In the autumn of 1587 he journeyed through Bologna and Loreto to Rome, taking up his quarters there with an old friend, Scipione Gonzaga, now patriarch of Jerusalem. In 1589 he returned to Rome, and took up his quarters again with the patriarch of Jerusalem. The servants found him insufferable, and turned him out. He fell ill, and went to a hospital. The patriarch in 1590 again received him. But Tasso's restless spirit drove him forth to Florence. He spent the next four years wandering throughout Italy, homeless and almost forgotten. His health grew ever feebler and his genius dimmer. In 1592 he gave to the public a revised version of the Gerusalemme. It was called the Gerusalemme Conquistata. All that made the poem of his early manhood charming he rigidly erased. Scholars now agree this version of the Gersualemme is far inferior to the original poem that Tasso had composed before his decades of madness and imprisonment. Worn out with illness, Tasso reached Rome in November, where the pope had promised to appoint him as poet laureate. The ceremony of his coronation was deferred because Cardinal Aldobrandini had fallen ill, but the pope assigned him a pension; and, under the pressure of pontifical remonstrance, Prince Avellino, who held Tasso's maternal estate, agreed to discharge a portion of his claims by payment of a yearly rent-charge. At no time since Tasso left St. Anna had the heavens apparently so smiled upon him. Capitolian honors and money were now at his disposal, yet fortune came too late. Before he wore the crown of poet laureate, or the received his pensions, he ascended to the convent of Sant' Onofrio, on a stormy April 1, 1595. Seeing a cardinal's coach toil up the steep Trasteverine Hill, the monks came to the door to greet it. From the carriage stepped Tasso, on the verge of death. Tasso died in St. Onofrio, on April 25, 1595. He was just past 51; and the last twenty years of his existence had been practically and artistically ineffectual. At the age of 31, the Gerusalemme, as we have it, was realized. It is now believed that the disease from which Tasso suffered was schizophrenia. His life, and his work, is a testament not only to his genius, but his ability to survive even in the face of the overwhelming odds of mental disease. This page was last modified on 11 December 2015, at 23:16.